Web page load time is an important factor in we design and development, not only web developes but bloggers and site owners need to optimize their web pages so they load faster or else retaining users will be difficult. There are many tools which analyze web pages and show you ways to improve load times. Firebug for Firefox is a useful addon for analyzing web page css, js and other stuff. Google has released a Firefox addon called Page Speed today that is integrated with Firebug, that means you need Firebug for Firefox and of course Firefox before you can install this addon. The Page speed addon when installed adds tabs to Firebug console. 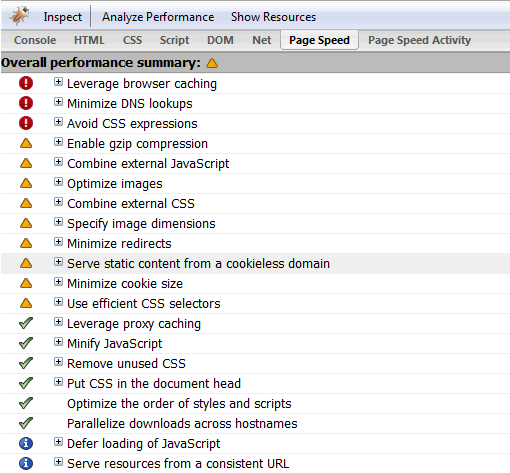 You can analyze web page performance using this addon, click on â€œAnalyze Performanceâ€ button in the page speed tab in firebug. It gives optimization tips upon examining the web pages. The tips ranges from highly recommended, moderate to least. These tips will provide short description and clicking on the link will take you to page speed documentation where you can read more on how to optimize your site. The Show Resources link will show you the objects loaded in the web page with the type of the object, file size and transfer size. You might find some scripts and images that are too heavy here, better to get rid of them or minimize them. Yahoo long has a similar addon called YSlow for Firebug that analyzes web pages and suggests improvements for performance of web pages.